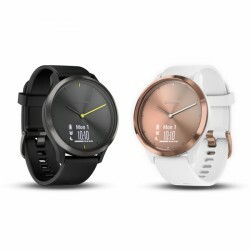 At the moment, the demand of the Garmin Vivomove is distinctively higher than the product availability. However, being a selected premium specialist retailer, Sport-Tiedje is preferably delivered by Garmin and we will be one of the first to receive the new Vívomove. However, we recommend to (pre-)order due to the high demand in order to avoid longer waits. In the hybrid smartwatch, the Garmin Vivomove HR, the traditional watch is combined with a touch screen. The smart display is only shown, when the lift quickly the arm to take a look at the watch. When using the touch screen, the watch hands even move dynamically, but still show the correct time again, once your have finished. Furthermore, the functionality and the fashion are combined as well. The Garmin Vivomove HR shows you the progress of your day. The watch measures your heart rate directly on the wrist and saves the number of steps as well as the covered floors or your sleep. Moreover, the smart watch provides additional information about the calorie consumption and calculates the intensity of your fitness activities by means of your heart rate data. The sport tools of the watch give you an additional overview of your current fitness level. The heart rate measuring on the wrist calculates the VO2max, so that your sport age is determined. It is improved in the long term by hard work and regular training. The smart watch is ideally designed for the 24/7 use, so that it is even waterproof with 5 ATM (50 metres). That means that you can wear the watch while taking a shower or while swimming. The battery lifetime of the watch is up to five days in the smart mode or up to 14 days in the analogue mode. Even the use at fitness gyms is easily possible, because the Garmin Vivomove HR measures your repetitions during the training. Sets, reps, and breaks are reliably recorded. The integrated stress level tracking of the vívomove HR smartwatch is an absolute innovation. Here, you are informed whether it has been a day full of stress, a balanced or even a relaxed day. When your stress level is increasing throughout the day, the watch suggests to take a break. Here, the physical symptoms like headache are prevented. The relaxation timer supports you additionally with guided respiratory exercises in order to reduce your stress level even more. You never miss any messages again thanks to the integrated Smart Notifications. The smart watch displays messages, mails, calls, dates, news, and more directly on the display of the wearables, so that you never miss any messages or news again. When you synchronise your activities with Garmin Connect, you do not only save your data. Garmin Connect is a frequently visited online community. Members can get in touch with others and compete against each other when doing challenges, they can motivate each other or share their success with others via social media. Garmin Connect is for free and is available on the Internet or on your smartphone, when using the Garmin Connect™ Mobile App. Articolo come da descrizione!! Molto soddisfatto dell'acquisto!! Hodinky předčily moje očekávání, dělají vše co mají tj. hodně používám notifikace z telefonu, výdrž opravdu 5 dní. Navíc vypadají úžasně. Šnorchnoval jsem s nimi i v moři. Paráda. Prostě Garmin! :) Mohu jen doporučit.